“We are in the presence of greatness,” announced an ebullient Congressman Joseph Crowley to a roomful of dignitaries, celebrities and activists who had gathered to hear Burmese opposition leader Daw Aung San Suu Kyi on her first visit to the U.S. after nearly two decades of enforced isolation in Rangoon. To me, Crowley’s statement was not hyperbolic. For almost twenty years as a professional in the field of human rights, I had looked upon “The Lady,” as Suu Kyi is oft-referred, as the personification of moral leadership in our time. Nothing short of a role model on the scale of Gandhi and Martin Luther King. After years of assuming I would never have the opportunity to see her in person, there I was on the campus of Queens College in New York early on a Saturday morning to simply soak in her presence. 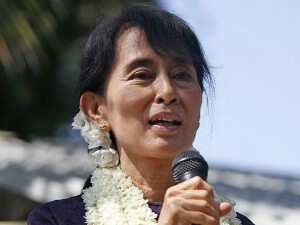 There is much more to be said about Burma and Aung San Suu Kyi’s role in its nascent democracy. But on a day designed for reflection and celebration, I hope you, too, find encouragement in her example and her words.